Hunter Henry: Complete Tight End? 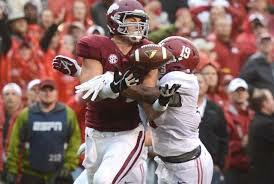 TE-Hunter Henry, Arkansas, 6′ 5″ 250 lbs. Cons: There is a lot of talk about what an all-around tight end he is. The truth is that the former Razorback did not block much in college and at times took plays off. In fact, he lined up at full back, about half the time split out, and sometimes as an inline tight end. Henry’s legs are not fully developed; if he is to be used as an inline NFL tight end, the tight end will need to have a powerful trunk to move athletic outside backers and defensive ends out-of-the-way. His 13 reps on the 225 lbs. bench shows a lack of commitment, but NFL jobs are not found on the gym floor alone. Henry does not run the crispest of routes as he sometimes drifts out-of-place; this will need to be tightened up in the NFL. Pros: The tight end releases off the line quickly, changes directions smoothly, and has the strength/size to dominate defensive backs easily. There were quite a few plays where he would chuck or stiff-arm defenders out of his way. Henry is a very fluid player that tracks the ball well in the air and can run underneath making the reception in stride, sometimes as a bucket catch. The former Razorback attacks the pigskin at its highest point with his strong, soft hands, while skying above the defense to come down with contested passes. He can contort his body towards poorly thrown balls showing good concentration and is a great red zone threat. Amazing plays are not unusual for him with one-handed grabs or backwards lateral passes to convert 4th and 25 yards to go. Henry did not do a lot of blocking, but he was efficient especially during passing plays. Initial impressions: He needs to get stronger at the point of attack as I do not see him as athletic as a Tyler Eifert. Henry reminds me more of second year Oakland tight end Clive Walford, who took some time to get adjusted to the NFL. The former Razorback is still the best tight end in his class, but will need a season or two to be a contributing fantasy factor. « Joey Bosa: A Family Tradition?